I use them daily in my massage practice and in my home! I started using essential oils over four years ago and have had some miraculous experiences. Also I want you to know that when I was approached about YL I had my doubts so I decided that I had to use it and live it, make sure the proof was in the pudding before I would sell it... And trust me, YL oils have lived up to the hype in my book. I would love to share some of the way I use oils in my life, like cleaning, skin care, ailments, massage and so much more! So call me or email me if you are interested in learning more. Or just ask me when you come in for your services! 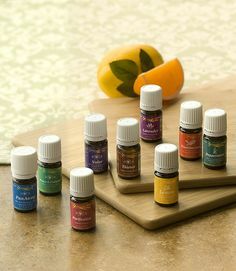 Remember to check in with Minzel Massage on Facebook for updates and to keep up to date on upcoming Young Living Essential Oil informational classes. The Everyday Oils collection is the perfect beginner kit, containing nine of Young Living’s most versatile essential oils for cooking, first aid, skin care, cleaning and more. There is no monthly obligation if you sign-up for the Young Living discount! Order what you need, when you need it, with no pressure to sell. But just remember... that's what they told me!!! Now I am hooked and can't stop telling everyone about it. You do not need to attend a party to sign up! "I was diagnosed with Fibromyalgia and Osteoarthritis at the age of 36, I was having great difficulty walking as well as just coping. I went to see Emy and felt relief right awa..."
"I have received Reiki from Emy and she is a very gifted healer. If you are looking to heal your soul or simply relax and get away for an hour Minzel Massage & Body Works will ma..."
Buy 5 - 90minute sessions get one Free!